Today, we congratulate Kalianna Nicholotti on her promotion to the rank of Captain! She has officially completed her Captaincy Exam requirements, and her promotion has been approved by the Executive Council. Kali has been a member of the fleet since 2009, when she joined the USS Resolution under the command of Fleet Captain Toni Turner. 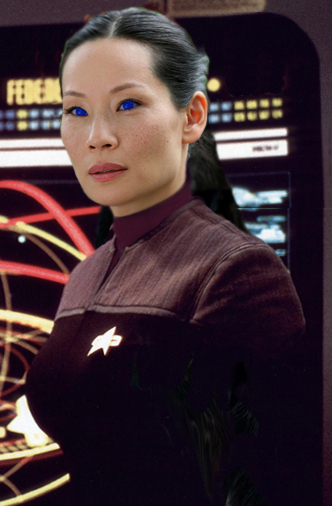 She later served on the USS Eagle, USS Victory, and StarBase 118 Ops. Kali assumed command of StarBase 118 Ops when Captain Andrus Jaxx launched the USS Apollo. She has faithfully served the fleet in many ventures. Kali is the facilitator of the Image Team and serves on the News Team, Podcast Team, Training Team, and Publicity Team. She and her crew will remain aboard StarBase 118 Ops for the near future. We look forward to hearing more about the adventures of StarBase 118 Ops, and the USS Victory under the command of their newly promoted Captain, Kali Nicholotti!